How do Sky Tunnel Tubular Skylights Work? Sunlight enters the Sky Tunnel Dome. The UV stabilized, high impact, acrylic dome has a very high light transmittance allowing more of light to enter into the tube. Sunlight is reflected through the Sky Tunnel mirror-like tube. The sunlight then reflects down a highly reflective mirror like tube, connecting the roof to the ceiling. 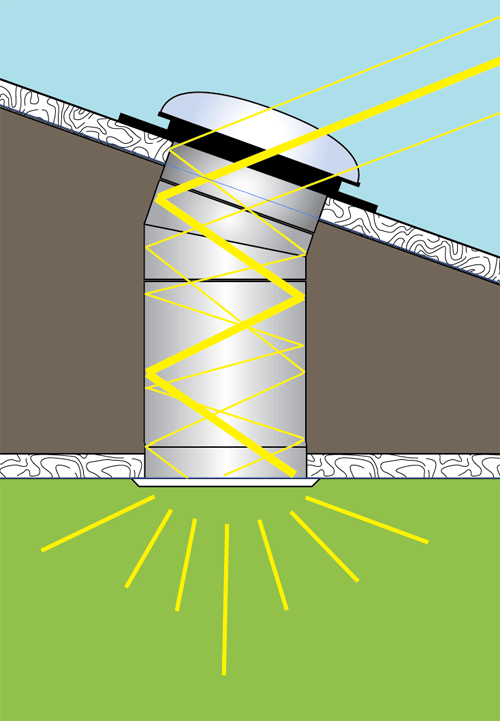 The high reflection of the tube means the performance is still very efficient, even during times when available sunlight is reduced such as early morning, late afternoon and during overcast conditions. Sky Tunnel Diffuser then evenly disperses the sunlight into the building. The sunlight that has reflected down the tube then passes through two layers of textured acrylic, which have been specifically designed to spread the light evenly around the room. These diffusers also have a very high light transmittance allowing more of light to pass through them.